Named after a Hindu temple in Siem Reap Banteay Srey translates from Khmer to 'Fortress of Women'. Canadian born Freya Metz is the exceptional human who put this project together back in 2010. She had a vision of creating a space for Khmer women from difficult backgrounds. So they could work and develop themselves in a safe environment. The problem largely exists due to the Khmer Rouge genocide, which has resulted in lack of education, restrictive choices and a low status of women. The project has three enterprises. The woman's spa, the vegetarian cafe and the yoga studio. 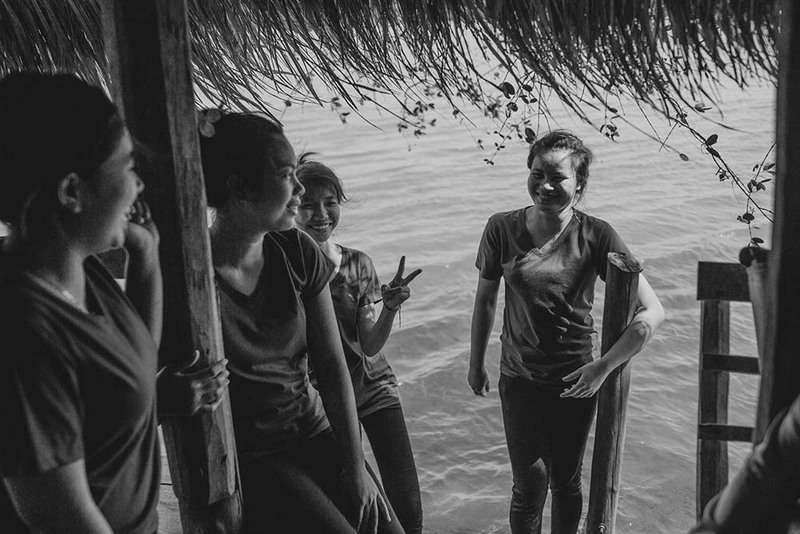 The Khmer girls working onsite are taught English, daily yoga, new spa skills, cooking, cleaning, life skills and the project also funds any medical or maternity pay they require as well any accommodation needed. So after Skyping with Freya back in July 2017 I loved what she was doing and I wanted to share my knowledge of yoga and help out with designing and building them a new website. So she booked me in for two months volunteering in December and January. And I'm so glad she did as it turned out to be an extremely rewarding experience that I'll likely never forget. I'm not gonna lie, it was a daunting prospect for me, the thought of teaching my first yoga gig. You would think more so with the paying guest classes, but no. I was terrified of teaching the Khmer girls! These ladies have a lot of different yoga teachers from all over the world coming through, so some of them really know what they are doing! It took me a week to get over my nerves and then it was all gravy, baby. I loved teaching the girls and I loved teaching the guests on the beautiful outdoor yoga deck. Although there was a language barrier with the girls and me, it didn't matter at all and after my two months with them, I blubbed like a baby when it came time to say goodbye. Such truly truly beautiful souls and I feel grateful to have met them. If you think you'd like to donate or volunteer your skills and put your energy into a worthwhile project, then you can find out more about getting involved on the Banteay Srey website. Kampot is not a bad place to spend some time either. The town itself runs along Kampot River and the old town has a certain charm to it due to the 19th century French colonial architecture. Which looks like it might crumble to pieces if you touched it. On further inspection of the interiors, you'll find buildings that go right back, with huge ceilings, gorgeous French tiles, wooden floorboards and massive windows. There's a quaint little bookshop in the old Town called Bookish Bazaar that is the perfect example of this and a lovely place grab a coffee and get some work done. During my time in Cambodia I was pretty busy, as I was designing for my own clients too and it also felt like the right time to dive head first back into the dating scene, after a couple of years break. Dating in Cambodia! Back in the game! A fun and educational experience. I've learnt dating isn't any easier when you're traveling, maybe its harder. I would say its definitely more fun, but its so transient and everyone still has their baggage. I met some nice and not to be so nice souls, but I like to think everyone I meet on this journey of mine has taught me something about myself. You learn and you grow. You get stronger because you know yourself more and you know what is good for you, and what isn't. But I think most importantly you learn to trust yourself, to trust your intuition, if something is making you feel anxious or you feel unsure about a person or a situation, its probably because something is up! Your intuition serves to protect you. But on the same note... if it feels right, go for it! You're higher self knows best. Twenty Three - Not sure what style of food but it reminded me of some quality London gastropub food. Green House is a hidden gem and my absolute favourite place, a little bit out of town and down a bumpy dirt road. This restaurant and guest house features a traditional Khmer house transported by truck from Phnom Penh, where it used to be a popular bar. The French owners rustle up a lovely traditional cuisine and an impressive wine list for Cambodia! More on the pricey side but during the day you can order a drink and tan on the deck swim in the river or hire a paddle board or kayak. And the view is dreamy, this was my go to place on days off! Of course there are plenty of excellent Khmer places to eat, but you will have to ask the locals about those. Upstream on the old town side of the river there are plenty of guesthouses worth visiting for food, drink or swimming. Most notably Meraki for the nice vibes and Ganesha for the natural swimming pool. And on the other side, check out Bohemiaz, also with a nice natural swimming pool and decent menu. There isn't THAT much to do in Kampot, maybe that is why there is a bit of a booze/party scene going on. Tuesdays - Taco Tuesdays at Karma Traders - live music and cheap tacos. Whats not to love? Fridays - Banyan Tree. Sometimes they have live music and you'll find all the local expats here on the dancefloor every Friday. Hit and Miss. Every night - O'Neils. Who doesn't love an Irish pub? You'll end up making new friends for sure. Waterfalls - I only managed to make it to Tada Waterfall, which is a nice 20min scooter ride out of town. Nice but lots of tourists. Sending love to my friends in Kampot, hope to see you again soon.